Well-this is my life right now. 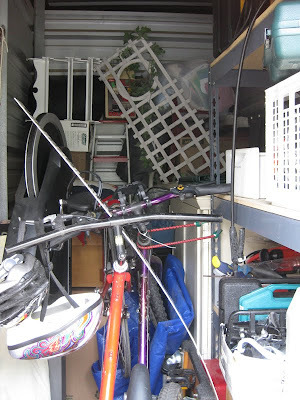 All our stuff is in 3 storage units-we kept adding on as things were moved in and using up the space. We are settled in our tiny, and I mean tiny, apartment. I've concluded-Moving is Not Fun! Anyway it's done for now. We'll have more time to look at houses. We made offers on 2 different old houses-and neither one went through. Now we'll look at newer houses around where we live now. I'm not quite ready to give up on the vintage house yet-but there's not much in the area we want in our price range, that fits our criteria. As we were packing up the old house, I pulled down from a ledge, a collection of old shoe shine boxes that had been up there for 13 years. 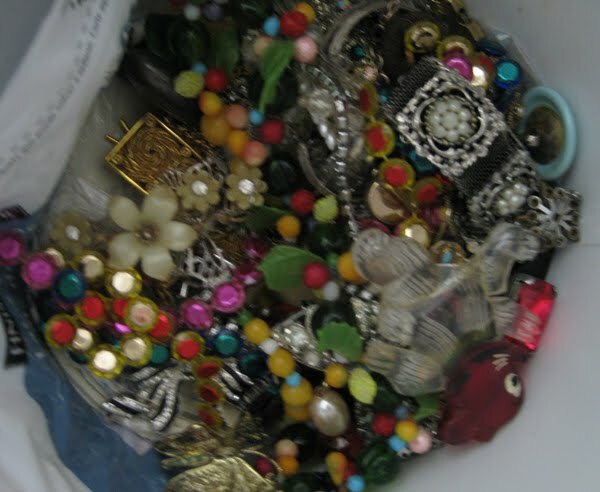 One was kind of heavy, so I opened it to find this treasure chest full of vintage jewelry. My Mom had given it to me years ago, and I completely forgot about it. What a nice surprise in the midst of all the chaos. 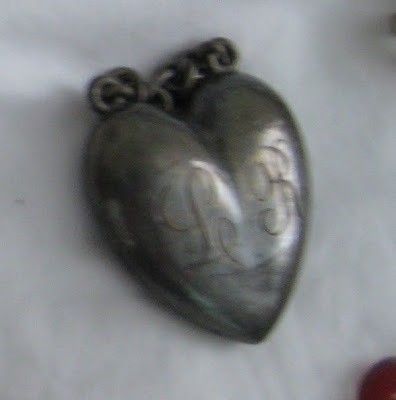 The heart above has a L and R-My husbands name begins with R.
Some of the pieces are rhinestone and plastic and all kinds of stuff. Anyway. it was fun to go through it all. I hope you find a little surprise in your life! Have a great Wednesday! It's good to be back! What a wonderful surprise! Isn't it fun to find something that we forgot we had? I hope your dream of a vintage house comes true, and I've got my fingers crossed for you! Oh, how lucky! What a nice surprise indeed. 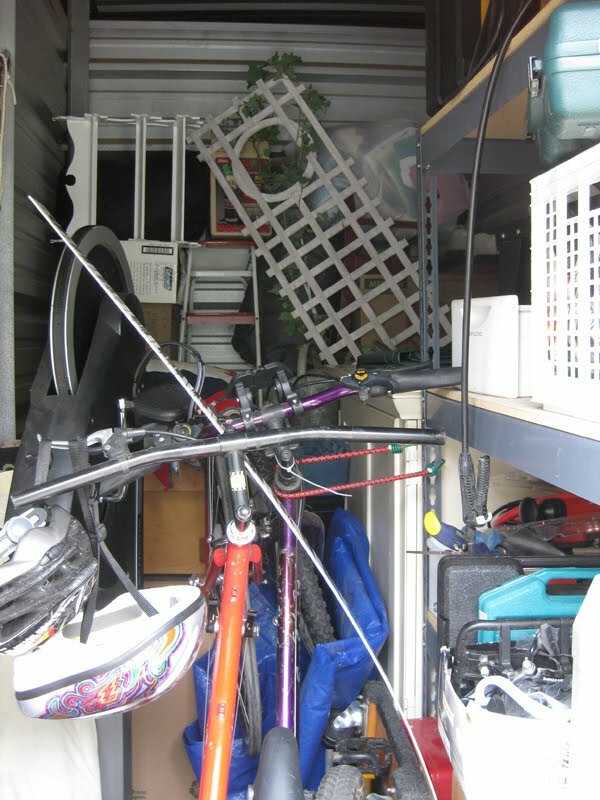 Hmmm... wonder if I have any treasures hidden around my house that I forgot about. I should go on a hunt! I don't envy the stress of moving and finding a house, but your stash of vintage jewelry is just wonderful. Best wishes on the house hunt. I hope you can find the perfect vintage house. Hey girl take a quick visit this week over at my house..you might want to do this..if not I do understand. Hope you find a home soon!! Oh gosh, your first photo looks very much like my little house right now, it's so crammed with boxes from my parents house. WAH! I've stopped bringing boxes home with me, there's barely any room to walk around the house now. Kind of funny. But not. How wonderful to refind the heart your mother gave you! I uttered "ohhhhhhhh" out loud when I read that. So sweet. Hoping you find the vintage-y house you're looking for soon! Morning...Miss you!! How are you doing? Hurry back!! 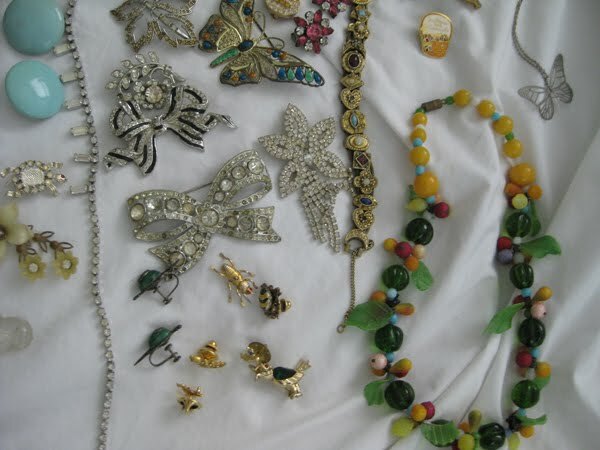 What lovely vintage jewelry you found stored away! I bet you are glad you went through everything. How is your househunt going? Hi Leslie! Checking in to see how you are - hope this finds you well and happy and cozy in your new vintage home! Leslie! Yoohoo, are you still out there?! Sometimes I think I see your little footprints on my blog - hoping it is you and that all is well at your end. Thinking of you, missing you and wishing you all good things in 2012! Leslie we miss you! I pray all is well with you and your family.